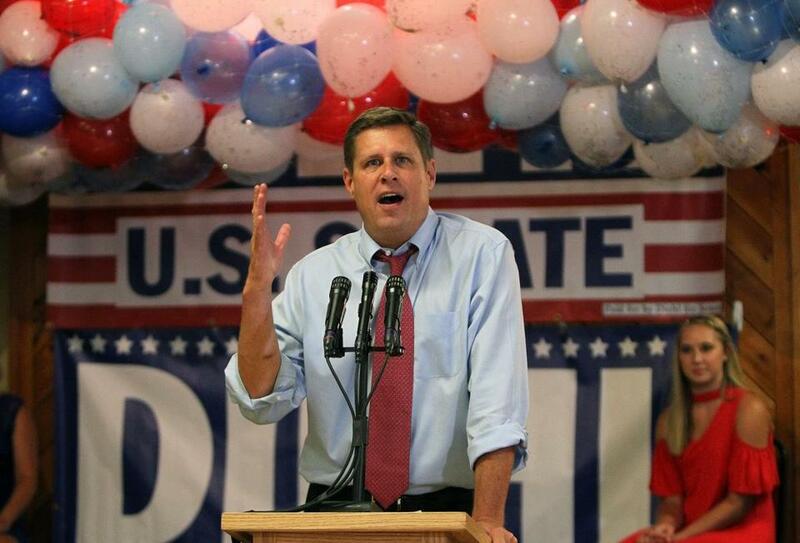 State Representative Geoff Diehl (above) supports the proposal by one GOP committeeman, Marty Lamb of Holliston, to name Black Lives Matter as a leftist hate group. The contentious debate among GOP state committee members about an anti-hate-speech resolution is showing the first sharp divisions in the party’s US Senate primary. At issue is the proposal by one GOP committeeman, Marty Lamb of Holliston, to name Black Lives Matter as a leftist hate group, equating it with right-wing hate groups such as the Ku Klux Klan and neo-Nazis. Lamb objects to BLM’s description of Israel’s treatment of Palestinians as a form of genocide. Of three major candidates hoping to face US Senator Elizabeth Warren in the 2018 election, only one of the two moderates — businessman John Kingston — is joining Governor Charlie Baker and several state GOP committee members in rejecting the notion that BLM is a hate group. Asked to comment on the internal party debate, a spokesperson for the other moderate Republican, veteran strategist Beth Lindstrom, responded with a statement in which Lindstrom denounced the violence of “left-wing antifa protestors’’ but does not mention BLM. State Representative Geoff Diehl supports Lamb’s position. The Whitman GOP lawmaker’s political base is rooted in President Trump’s wing of the state GOP. In the wake of violence following a white nationalist rally in Charlottesville, Va., Trump said “both sides” were to blame, equating the white nationalists and counter-protestors. And Lamb, a Diehl political ally, is co-chairing the Deal Her Out political action committee aimed at spending millions of dollars to defeat Warren. The wording is a not-too-subtle reference to Diehl’s name. “Any group that advocates for violence against others especially law enforcement and groups that actively engage in violence such as ANTIFA (the leftist anti-fascist group that condones violent confrontations) should be addressed in the resolution,’’ said Diehl’s chief campaign strategist, Holly Robichaud, in a statement. She confirmed that Diehl includes BLM among those groups. But she also took the opportunity to tweak Kingston, claiming he was somehow using his support for Black Lives Matter to “cover up” his involvement in a website that contains controversial anti-Israel material. “Kingston supporting the MA GOP resolution is an effort to cover his tracks for publishing questionable material on his nonprofit website such as: What Israel is doing to Palestine is actual genocide,” she said. She is referring to his role as director of Colorado-based website Patheos.com, which is intended to promote what it calls a “stimulating discussion” among faith communities, academics, and the broader public. Some of its postings are on the political fringe. Kingston campaign manager Cathy Fair shot back.